My husband’s love for peaches runs about as deep as my love for sweetened condensed milk. He bought 4 cases of peaches this summer to eat fresh and make cobblers, peach melba, peach gelée candies and ice-cream. And he’s got a stash in the freezer for this winter. So, it’s surprising I haven’t shared his recipe for peach ice-cream until now. 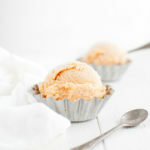 He started making this peach ice-cream about 20 years ago after he first discovered it in a cookbook on board a ship while he was doing a sea semester with the Sea Education Association. Mind you, the ship wasn’t a cruise ship. It was a research ship and ice (and the ability to make ice-cream) was non-existent. So, who knows why an ice-cream cookbook would be in the ship’s library. After drooling over the recipes for 8 weeks at sea, my husband bought the cookbook as soon as he got home and started cooking his way through it. This was one of his favorites. No wonder, given the generous portion of fresh peaches puréed and stirred into the ice-cream base. It’s summer in a bowl – refreshingly sweet and creamy. Note that the recipe makes 2 quarts. If you’re like me and have a 1 quart ice-cream freezer, you’ll need to freeze the ice-cream in batches. I don’t even wash out the freezer bowl in between batches. I just put the bowl in a plastic bag, close it with a twist-tie, put it in the freezer for 8-12 hours then freeze the next batch. This way, when I have discovered that the first quart has mysteriously disappeared somehow, I have a second quart all ready to go. Beat eggs with a whisk in a metal bowl until thick and lemon colored. Bring 1-2 inches of water to a boil in a medium saucepan. Place the bowl with beaten eggs over saucepan and, whisking constantly, heat eggs until they reach 120-130 degrees. Remove from heat. Beat sugar into eggs. Stir in milk, vanilla and almond extract; set aside. Puree peaches in a blender or food processor until only small pieces remain. Stir peaches into egg mixture. Stir in whipping cream. Cover and chill the mixture thoroughly (at least 2 hours). Transfer the mixture to an ice cream maker and freeze according to the manufacturer’s instructions (this may need to be done in batches if your ice-cream maker doesn’t hold 2 quarts). Then, transfer the ice-cream to a freezer-safe container, cover and freeze until firm, 3 to 4 hours, before serving. Recipe adapted from Ice Cream by Mable & Gar Hoffman.